The Grand Gulch/Cedar Mesa Plateau is a unique area for exploring. This is a place where cultural resources are found in remote, primitive and wilderness-like settings. Select the YouTube icon below to watch a short video on Moon House Ruins. Moon House is a very well preserved ruin that sits on a ledge midway up the side of McCloyd Canyon. A round trip to visit and explore the ruins will require approximately 3 or 4 hours. The route is less then 1/2 mile but some minor scrambling is required to work you way through several cliff bands. This is a desert environment, every member of your hiking party should carry a minimum of at least one liter of water. The ruins are accessible year round in good weather. You will want to bring a flashlight when you visit the ruin to look inside the rooms. The center room of the main structure contains a crescent moon and a full moon painted on the walls which give the ruin its name. Please do not enter the room but view the paintings using a flashlight. You will not find many surface artifacts like pottery shards at Moon House because of a 1974 surface collection by archaeologists which recovered all small visible artifacts. A BLM Backcountry Permit is required to hike McCloyd Canyon. The closest permit station is a self serve located 1 mile from Utah Highway 261 on the Snow Flats Road (SJC 237). You will drive right next to this station on your way to the trailhead. Beginning in 2010 you will also need a McCloyd Canyon/Moon House Recreation Management Zone Day Use Permit as noted below. Public access will be limited to 36 people per day via a permit system for day visits. Entry into Moon House Recreation Management Zone requires a Special Recreation Permit available only at the Kane Gulch Ranger Station during the high use season. 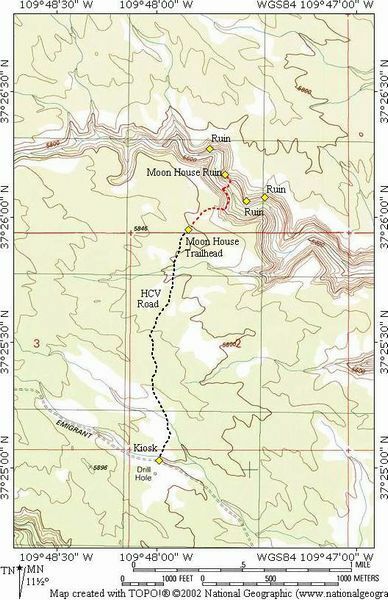 Day, Week, and Annual Permit holders must get their permits validated for Moon House hikes at the Kane Gulch Ranger Station prior to their hike. During the off season, permits will be available on a first come first serve basis at the trailhead entry. All commercial and private groups of 8 or more must have an advance reservation, available from the Monticello Field Office permit desk. Maximum group size is 12. There is no overnight camping within the Management Zone, and car camping is limited only to the designated primitive camp and park area south of Snow Flat Road. Pets are not allowed in this management zone. A high clearance vehicle is advised for accessing this trailhead, four-wheel-drive is not required. This area is criss-crossed with roads. Stay on the road described until told to turn off of it. The trailhead contains parking for several vehicles. Camping is available in several locations near the trailhead. From Blanding, Utah travel south on Utah Highway 191 for 3 miles to the junction of Utah Highway 191 and Utah Highway 95. Travel west 28 miles on Utah Highway 95 to the junction of Utah Highway 95 and Utah Highway 261. Travel south on Utah Highway 261 for approximately 10 miles to mile marker 22.5 and the signed Snow Flats Road (N37° 26' 28", W109° 55' 22"). Turn east (left) onto the Snow Flats Road (SJC 237). Follow the dirt road for 0.4 miles to a fork. Take the north (left) fork and drive an additional 7.7 miles. At this point you should see an information kiosk (N37° 25' 02", W109° 47' 59") on the north (left) side of the road and a parking area for several cars on the south side of the road. In the past the BLM has attempted to close the road at this point and force everyone to hike in. Thanks to San Juan County this road is again open for public use. At the information kiosk turn north (left) and follow the road 1.1 miles north to the Moon House Trailhead. You will know you have reached the trailhead when signs noting "no vehicles beyond this point" are encountered. There is parking for several vehicles at the trailhead. From the Moon House Trailhead (N37° 25' 57", W109° 47' 51") hike northeast along the well defined trail to the rim of McCloyd Canyon. From the canyon rim the route snakes down through the cliff bands to the bottom of the canyon. The trail is extremely well cairned and not difficult to follow through the cliff bands if care is used to assure you are on the right route. About midway down into the canyon you should be able to look across McCloyd Canyon and see Moon House Ruins. Upon reaching the canyon bottom hike downstream 50-yards to the weakness up jumbled rocks that allows scrambling access to Moon House Ruins (N37° 26' 10", W109° 47' 40"). Best time to photograph: Sunrise to just after sunrise. By mid-morning the ruins are in sun/shade. By walking 1/2 mile east or west on the same ledge that Moon House is located on you will encounter several additional ruins that are worth visiting. The ruins to the east are particularly note worthy and nearly as good as Moon House but minus the pictographs. 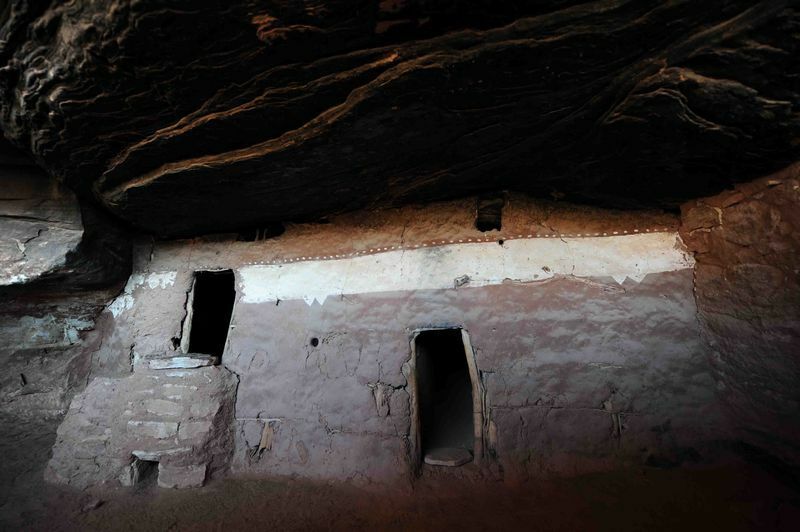 Moon House is one of the best Anasazi ruins to be found anywhere. It contains an inner chamber, with a protective curtain wall containing numerous loopholes strategically placed to aim arrows at intruders. Erected in 1262 A.D., the curtain wall shields a hidden courtyard similar to the construction of Medieval European castles built in the same time period. This location requires moderate route exploration and is marked on the downloadable map. Select the green “View Map” tab to view this location on Google maps. Download a free copy of the Four Factors of Filter Highlight Photography in PDF format by selecting the “ebook download” tab above. This 37 page guide covers how to take a single image and apply minor manipulations that will help you produce consistent reproducible results. You will also learn the processes of camera set-up, image editing, and advance scouting techniques used by professional photographer Christian James. Free park maps, tide tables reports, ebooks and additional information can be found under the Maps and Resource tab located in the black bar at the top of the screen. The best time to photograph the exterior ruins is early morning or evening. Moon House Ruins is located inside interior wall and can be photographed anytime. Nikon D700 14-24mm Lens @ 14mm.